I love my iPad as well as my iPhone. Not only are they great mobile devices, but they also have lots of storage space to carry thousands of photos and other illustrations. The biggest problem I have is finding a way to best utilize all that storage effectively. Although it’s a snap to move files from an iOS device to another mobile device or your computer (via e-mail, AirDrop, messages, etc. ), Apple doesn’t make it easy to transfer files to an iOS device. What consumers need is an easy way to get those important files onto your mobile devices. 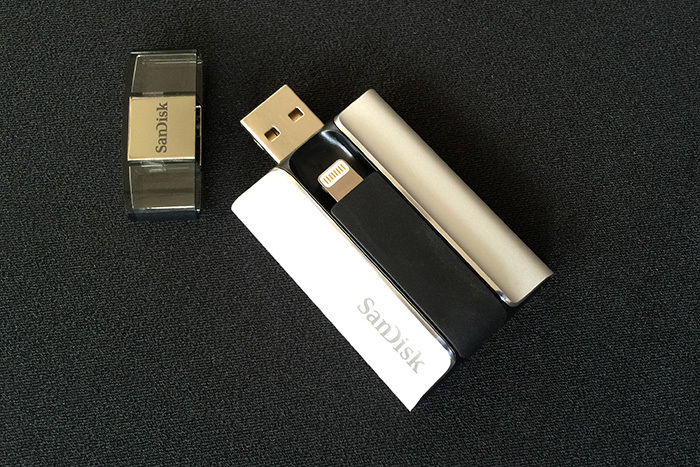 SanDisk – an industry leader in fast, reliable flash storage – has created a simple solution to this problem with its line of iXpand Flash Drives. The drives can be used in several ways that expand the functionality of your mobile devices. First, the highly portable disks can carry a large number of files for viewing when docked to a device. You can carry entire movies, portfolios of photographs, or files that would max out the internal storage capacity of your mobile device. It’s a great way to expand the capacity of a mobile device with a fixed amount on internal storage. Second, having a high-capacity external flash drive while on the road comes in very handy. You can use the drive to off-load photos and videos taken while away from home or the office, freeing up space on your mobile device’s internal storage. It’s also a prudent way to temporarily back-up files while on the road or when in situations where you can’t back-up to the Cloud. Third, the convenient disks can be used as a secure and reliable method of transferring files between iOS devices, as well as to and from computers. 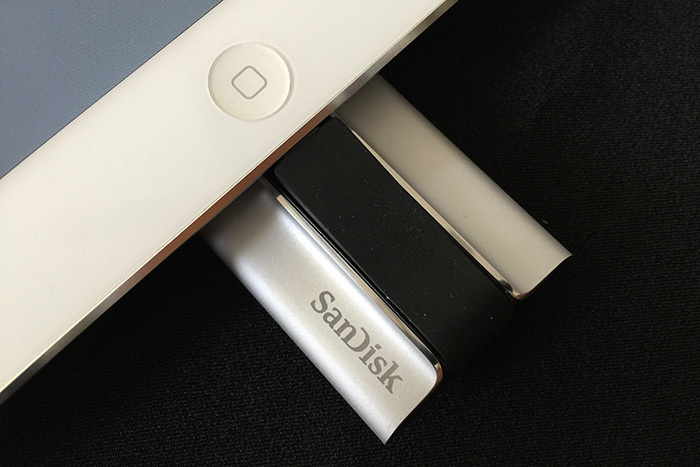 For those of you who have bought iPhones with limited memory capacity, the SanDisc iXpand flash drive lets you easily transfer photos and videos onto your mac or pc en masse. The drives are all surprisingly compact. The models measure a mere 2.5 inches long by less than 1.5 inches wide and less than a half inch at the deepest point. The overall width and length dimensions are smaller than a typical business card. Even though the drive weighs only a few ounces, the aluminum and plastic chassis feels substantial and the build quality is solid. It easily fits in your pocket, a small compartment in a backpack, or even a slot for business cards in the lid of a briefcase. The iXpand comes with two built-in connectors: a standard USB connector at the top (shielded when not in use with a slide-on transparent cover) and an Apple Lightning connector on the side with a ¾-inch rubber cord that stretches away from the body of the drive to allow connection to an iOS device. The small size of the drive is comparable to a typical USB flash drive, making connections via a computer’s USB connector easy and effortless. The drive charges when plugged into a USB port, and holds a charge well – if the indicator light on the side changes to red, just plug it in to a USB port. 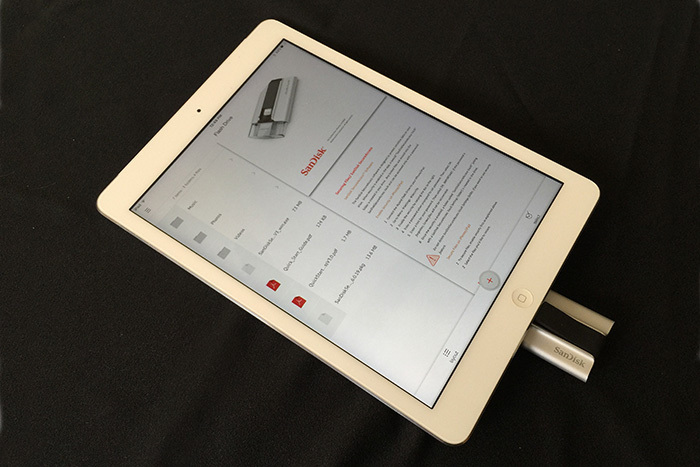 The flexible Lightning connector allows the iXpand to dock securely to an iPhone or iPad while keeping the mobile device as portable as possible. With the connector attached, the iXpand sits snugly against the back side of the device. For those of us who travel often, one of the best features of the iXpand is the ability to copy movies from my computer to the iXpand for viewing on my iPad. You can view the videos within the iXpand Sync software, which can read a whole host of video formats including AVI, MP4, WMV and MOV. Sync automatically transcodes the videos for viewing on the iPad (or iPhone) so you don’t have to worry about what format the videos are in. You can transfer files both to – as well as from – your mobile device using the iXpand Sync software. You upload files from your computer to the iXpand by simply dragging and dropping files to the iXpand, which displays as an external drive just like any USB flash drive. If you wish, you can further organize the files into new folders in the finder window on the computer. You can also easily upload files from mobile devices to transfer to other mobile devices or store for later use. 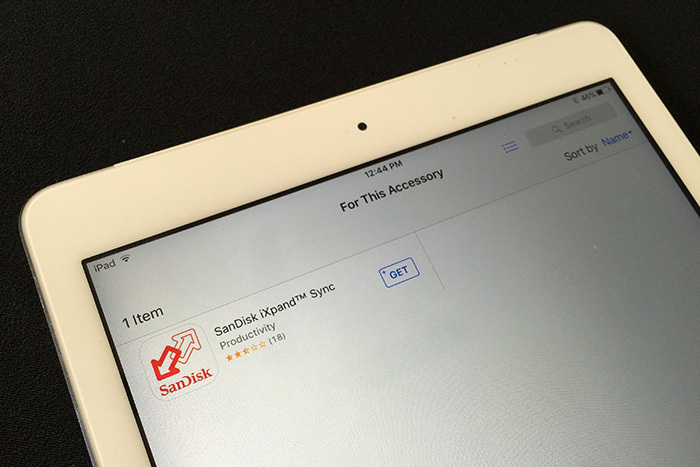 When you attach the iXpand to your mobile device, you’ll get a notice asking you to allow SanDisk Sync to access your device. When the App loads you see a main screen with a list of the folders on the iXpand and a plus button at the bottom to add files to the iOS device from the iXpand. There is also a menu icon at the top that allows you to access other functions, including auto-sync with your photo library, transfer contacts, help, and settings. There is also a “My Downloads” selection that allows you to access files you have transferred and stored on your iOS device. 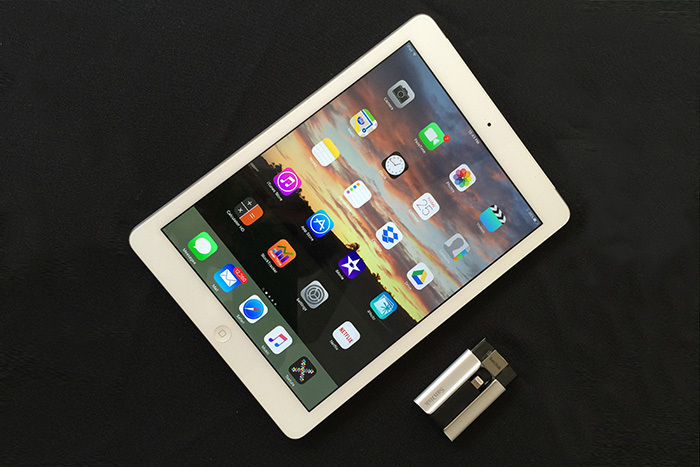 Transferring files to your iPad or iPhone is quite easy. First, you select an image or file that is contained on your iXpand drive. One of the small icons below is the standard “share” icon. When you choose that icon, one of the options is to “Save to My Downloads.” Touching that icon uploads the files to a special partition on your device – managed by iXpand Sync – that houses all of the files you store on your mobile device that are transferred from the iXpand drive. You can organize files into folders for easy access, just as you would on a computer desktop. This makes it easy to find files and keep your information organized. The SanDisk iXpand dives come in various capacities: 16GB ($40), 32GB ($50), 64GB ($76) and 128GB ($115). The prices quoted are typical online prices for these drives, which in most cases is less than the manufacturer’s suggested retail price. Overall, these portable multi-device drives offer an excellent balance between good value and flexible productivity.